An oath executed in a foreign country must be properly authenticated. On October 15, 1981, the Hague "Convention Abolishing the Requirement of Legalization for Foreign Public Documents" entered into force between the United States and 28 foreign countries as parties to the Convention. Subsequently, additional countries have become parties to the Convention. The Convention applies to any document submitted to the United States Patent and Trademark Office for filing or recording, which is sworn to or acknowledged by a notary public in any one of the member countries. The Convention abolishes the certification of the authority of the notary public in a member country by a diplomatic or consular officer of the United States and substitutes certification by a special certificate, or apostille, executed by an officer of the member country. Accordingly, the Office will accept for filing or recording a document sworn to or acknowledged before a notary public in a member country if the document bears, or has appended to it, an apostille certifying the notary’s authority. The requirement for a diplomatic or consular certificate, specified in 37 CFR 1.66, will not apply to a document sworn to or acknowledged before a notary public in a member country if an apostille is used. 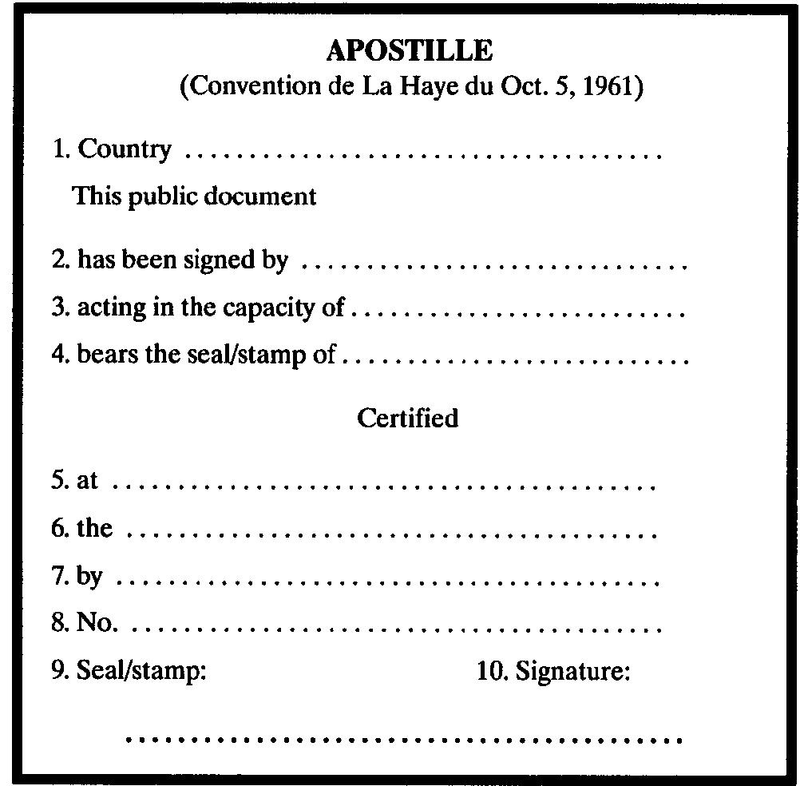 A list of the current member countries that are parties to the Hague Convention can be obtained from the Internet website of the Hague Conference on Private International Law at www.hcch.net/index_en.php by selecting "Apostille Section" under "International Legal Co-operation and Litigation" and then selecting "Status table of the Apostille Convention" under "Contracting States." The certificate will be in the form of a square with sides at least 9 centimeters long. When the oath is made in a foreign country not a member of the Hague Convention Abolishing the Requirement of Legalization for Foreign Public Documents, the authority of any officer other than a diplomatic or consular officer of the United States authorized to administer oaths must be proved by certificate of a diplomatic or consular officer of the United States. See 37 CFR 1.66. This proof may be through an intermediary, e.g., the consul may certify as to the authority and jurisdiction of another official who, in turn, may certify as to the authority and jurisdiction of the officer before whom the oath is taken. Where the oath is taken before an officer in a foreign country other than a diplomatic or consular officer of the United States and whose authority is not authenticated or accompanied with an apostille certifying the notary’s authority, the application is nevertheless accepted for purposes of examination. Applicant should submit a new oath properly authenticated by an appropriate diplomatic or consular officer, the filing of proper apostille, or a declaration (37 CFR 1.68 ). The Office does not return improperly authenticated oaths for proper authentication.